Static HTML website no longer served this up and coming trial lawyer. Mobile first baked into custom Wordpress Genesis design! 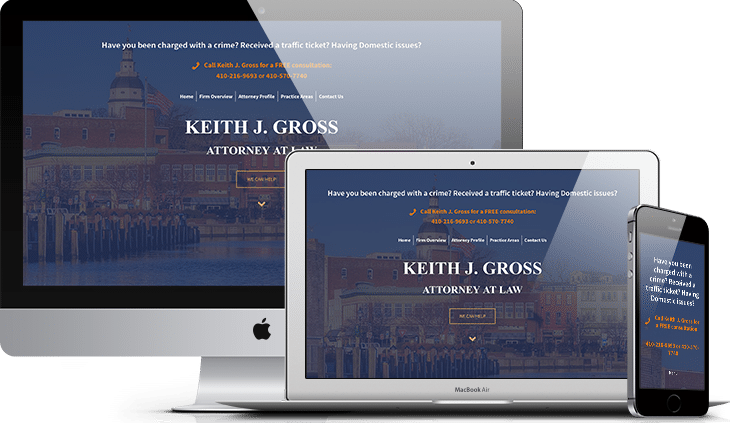 This trial lawyer practicing in Annapolis, Maryland came to us with an outdated static html website. He was frustrated because he was unable to make simple changes like adding his new office address. His original website developer had long since gone M.I.A. He agreed that it was time for a fresh makeover, so we went to work. We updated his hosting to a Managed WordPress service to give him more speed and security. A new custom Genesis WordPress theme was developed. We employed mobile first design practices. Research showed that nearly 90% of his clients access the internet solely from their phones, so we implemented one-click dialing. His clients are now automatically connected to him when they need him most.